Local Families Get "Fit 4 The King"
North Texans Get "Fit 4 The King"
Hundreds of North Texas families traveled to Fair Park in Dallas for Fit 4 The King Day. 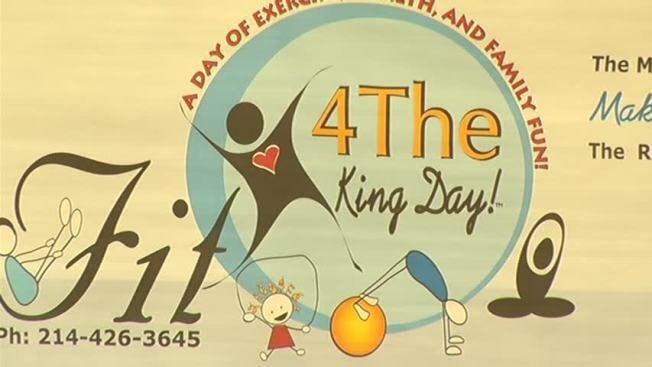 The Ron Springs "Gift For Life" Foundation teamed with the Martin Luther King, Jr. Family Clinic to encourage healthier lifestyles for families. "If we want to be around to see our children do the things they want to do in life, we've got to make some changes and share our experiences," Joyce Tapley, CEO of the Martin Luther King Jr., Family Clinic, said. Tapley understands the importance of living a healthy lifestyle. At 18, doctors diagnosed her with high cholesterol and thyroid disease. Three years ago, they discovered another health concern -- diabetes. "I have made a lot of changes in my lifestyle," she said. "I've never had issues with being overweight. I've always been active, but sometimes if it's in your family or you get it, you still have to figure out ways to accept it and continue to live and make changes." It's one of the reasons why she shares her story with her children and other families at events similar to Fit 4 The King Day. The free event allowed familes to receive health screenings, ask questions, and learn about organizations in their communities. Attendees also participated in jump rope, line dancing and obstacle courses. Organizers say part of the goal was to encourage people to get active, even at an early age. "We should not just take the easy way out and sit around and do nothing," Tapley said. "We can do things as a family and that keeps the kids motivated also." The event was inspired by the national "Let's Move" Campaign created by First Lady Michelle Obama. NBC 5 co-sponsored the event.